Posted on September 29, 2012 by Eric Bonnici wrote in Featured Italian, Featured Windsor Via Italia, Italian, Seafood, Windsor Via Italia. It has 0 Comment. Il Gabbiano Ristorante brings the contemporary combination of great Italian cuisine, internationally celebrated wines, and exhibits of creative art to Windsor’s Little Italy. This unique mix creates an open air terrace ambiance reminiscent of Italy’s romantic countryside. This fine dining establishment is perfect for admiring art, sipping wine, and enjoying succulent seafood, New York steaks, grilled veal chops, or creative pasta dishes alfresco style. Both traditional and innovative twists on classic Italian cuisine is the ultimate way to enjoy a meal with family, friends, or business associates. In addition, plenty of healthy choices are highlighted throughout the menu (they’re represented by a heart / check mark). For example, free range all natural chicken breast is used to make the Involtini di Pollo (stuffed chicken breast with goat cheese, spinach and rosted red peppers with a roasted tomato and garlic sauce). The chef’s selection of premium seafood is used in healthy Italian dishes like Salmone ai Ferri (grilled salmon with a signature lemon garlic herb EVOO sauce) and Pesci Bianco con Pomodoro e olive (pacific white fish sauteed with black olives, fresh spinach, and a light tomato sauce).Lamb chops, pork tenderloin, and milk fed Ontario veal are other healthy menu items. Of course there is plenty of healthy zuppe and insalate combinations. All pasta dishes are served with a house salad, fresh artesian bread, and whole wheat pasta substitution is available. Like the menu, the staff in this warm colorful dining establishment is attentive and happily caters to the needs of their dining room guests. The Wine Spectator, a distinguished wine magazine, praised Il Gabbiano Ristorante’s award winning wine list. The International Restaurant Rating Bureau also recognizes the diversity of wine styles, varieties, and producers represented. That’s because Il Gabbiano’s sommelier has carefully chosen the wine selections offered. Whether it’s wine by the glass, half bottle, or a rare vintage bottle, there is something for every occasion. 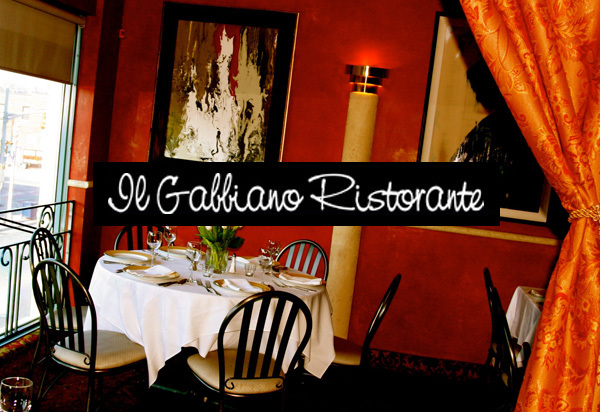 Il Gabbiano Ristorante also provides full service customized catering. The catering team takes care of all the details for any dinner party, gourmet barbecue, and other forms of entertainment. Il Gabbiano begins with great taste and ends with sophistication that goes beyond just eating to deliver a memorable dining experience in the heart of Windsor’s Via Italia.